There are two access routes to the Walbran: Through the Cowichan Valley and through Port Renfrew. You’ll find both below. Either route is going to take you through rough forest roads, some of which may be in active industrial use. While a 4WD vehicle isn’t strictly necessary, it does make negotiating the forest roads in any conditions an easier task. If you are not experienced with driving on BC forest roads we also recommend you read and heed the safe driving guides. A good one can be found here. Check road condition updates. Take the West Coast Road toward Port Renfrew at the end of that road. From Victoria this drive takes about 1.5 hours. As you approach Port Renfrew you will encounter the major intersection of Deering Road on your right; this intersection is prominent by the large road sign directing you to Lake Cowichan at this intersection. Stop, reset your trip odometer to 0.0 at this intersection, and proceed to the North along Deering Road. The 38.5 Km ahead of you will take about 1 -1.5 hours. Km 15.7 – Turn left off Gordon Main onto Bugaboo crossover road – just after the 36km Gordon Main road marker. From here there are some blue painted markers to help with directions. Km 20.6 – here you pass an impressive grove of large stumps. It boggles the mind what the forests of this island used to look like. Km 21.4 – A short rise onto a wide section of road, please do not spin tires on rise. Km 25.2 – Bugagoo crossover ends at Walbran Main. Turn left here. Also look around and take note of the intersection for your return journey. Km 38.5 – the road ends at a bridge over the Walbran River. Here are the printable Directions to the Walbran Valley via Port Renfrew. Drive 26 km to the town of Lake Cowichan. Set odometer to zero at the traffic circle and bridge in Lake Cowichan. This town is your last fueling stop. Go straight through the town of Lake Cowichan, past Mesachie Lake and Honeymoon Bay. At 12.5 km Stay on South Shore road. At 13.8 km stop sign: go right toward the Caycuse campsite. At 31.4 km a sign indicates Carmannah/Walbran Provincial Park to the right. GO STRAIGHT AHEAD HERE, onto the Caycuse Main Line. At 39.8 stay left on a very short one way section, as indicated on road. At 41.9 km stay straight and stay off spur roads. At 50.4 km continue ahead – do not turn right to cross bridge. At 55.2 km pass Mclure Lake on your left. At 58.7 km you reach the “Ballpark” road interchange, and continue straight ahead, onto Walbran Main – do not go up the hill to the right. At 62.4 km proceed ahead – do not go up the hill to your left. The road to your left is Bugaboo, the route leading back via Port Renfrew. At 70.9 km stay right and continue ahead. At 74.2 km turn right onto a smaller rougher road, and head down into the Walbran Valley. At 76.1 km Arrive at the bridge over Walbran creek. Congratulations! You have arrived at the Lower Walbran Valley! Take the time to explore the trails. Enjoy! 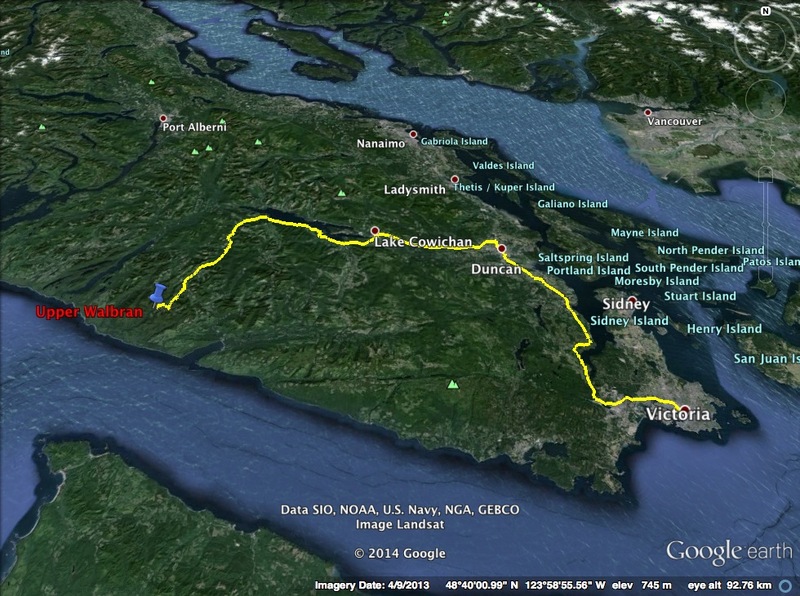 Here are the printable Directions to the Walbran Valley via Cowichan Lake. Thanks for letting me know – I will look in to it further. I have not heard of this happening to anybody else, but that doesn’t mean nobody has had the same problem. What browser are you using?